In 2012, CPAAAS, through the great efforts of Laura Collins, has moved to donations of items using coupons and specials to maximize the value of the donations to the food pantry. CPAAAS and member Laura Collins article in the Schaumburg e-Newsletter for 11/27/2013. To support the Schaumburg Township Food Pantry, residents may now drop-off grocer or pharmacy coupon circulars at the Atcher Municipal Center's western entrance, adjacent to the battery, cell phone/CFL bulb recycling receptacle. 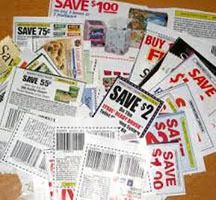 There's no need to cut out the coupons. These coupons allow members of the CPAAAS/Citizens' Police Academy Alumni Association of Schaumburg to purchase items for the food pantry at little or no cost as a result of your donating these weekly circulars. Contact Laura Collins at 847.882.7292 for additional information.